We got an email a couple of weeks ago from the one and only Bob Keelaghan, with a request and an offer. He asked (politely) if we wouldn't mind removing the download link for the Shoutin' Abner Pim and the Puritans tape we'd posted long ago (as downloads were interfering with the significant income the band was reaping from iTunes downloads of the CD it was later included on). 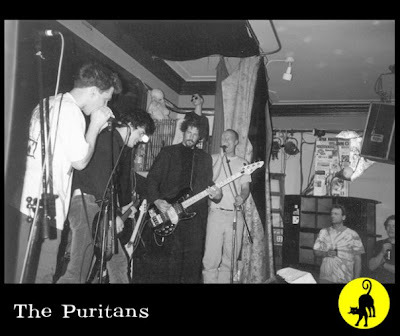 In return, he said he'd give us some old Puritans demos. Well, we're scared of Bob, so we capitulated. We want to make sure you caught that: the first three tracks feature one of our favourite Calgarian voices, Chris Temple. Well, two of them do, as one is an instrumental. And one of them is super slowed down, to hi-larious effect. Anyways, we think our deal with Bob worked out pretty well.